At Foam Works LLC. it is our sole objective to provide outstanding and reliable service to our vast array of customers. We offer a high quality spray foam insulation. With a diverse client base we individualize services to meet each of our customers needs. If you are looking for prompt, detailed and impeccable service, look no further. Our CEO, Ronald L. Christopher, Jr. has been in the construction business for over 20 years. What he has learned in these years is what it takes to construct a quality home. One of the most important components in a quality constructed home is insulation. That is why he has now branched out into the Polyurethane Spray Foam Insulation business. Foam Works LLC. has been established in the insulation market for years. Our experience with spray foam insulation stems from the years we have been providing insulation to our discerning customers. We have been in the business for some time and we have seen many other products come onto the insulation market that do not come nearly up to par with our products. Foam Works LLC. strives to create personal relationships with every customer. We give unsurpassed attention to each customer. We have simplified the formalities and therefore we are able to focus our attention completely on our client base, servicing our customers to the best of our abilities is our main goal. 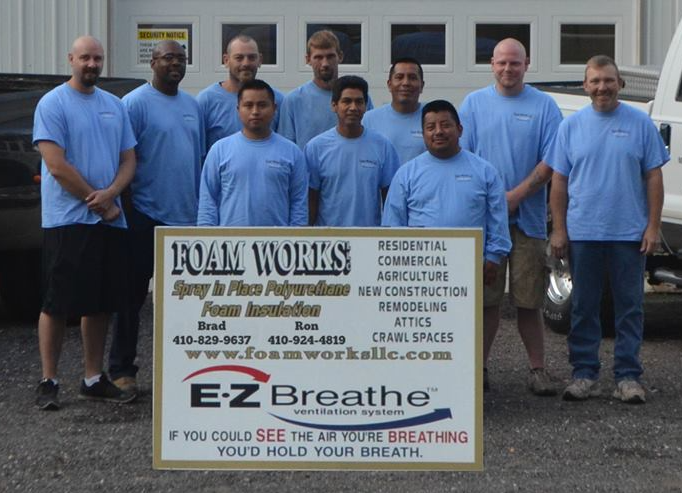 Foam Works, LLC is committed to providing affordable, healthy and energy efficient spray foam insulation solutions that are environmentally friendly, permanent and American made. We are experts in this field, and have extensive training and experience in designing solutions for residential (new and old), commercial, agricultural and steel frame projects.